• Emanuel is the only male player to compete in each of the first five beach Olympics (1996-2012). • Emanuel has been first in FIVB season points in 10 different seasons with five different partners. • He is a three-time World Champion (1999, 2003, 2011), winning with three different partners. Emanuel began playing Volleyball as an indoor player with Curitibano. He began his Beach Volleyball career in 1991 and started playing internationally in 1994. Including a pair of domestic titles to start the 2007 season, Emanuel has won 106 pro Beach Volleyball events, including 60 FIVB, 39 Brazilian (two King of the Beach), and seven on the American domestic tour. Forty-four of Emanuel's titles have been with Ricardo Santos. He is the SWATCH-FIVB World Tour leader in career earnings and gold medals. From 1994 through the 2006 season, Emanuel has compiled a 786-175 (81.8%) FIVB match record with eight different partners (158 events, including one Satellite stop). He has compiled a 289-55 FIVB record with Ricardo (2002-2006), 202-44 with Ze Marco de Melo (1995-1997), 175-37 with Jose Loiola (1998-2000) and 98-21 with Tande Ramos. The most valuable player at the Athens 2004 Olympics, Emanuel teamed and Ricardo to capture the Summer Games' gold medal with seven-straight wins. 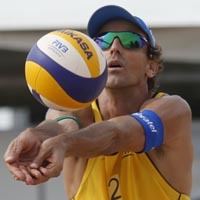 Emanuel has won SWATCH-FIVB World Championships with Loiola (1999 Marseille) and Ricardo (2003 Rio de Janeiro. Emanuel and Ricardo have teamed to win the most FIVB events (24), including 23 SWATCH-FIVB World Tour gold medals. Since starting their partnership at the end of the 2002 season, Emanuel and Ricardo have won the SWATCH point's title the past four seasons (2003, 2004, 2005 and 2006). Emanuel and Loiola won six-straight SWATCH-FIVB World Tour events in 1999 (Norway, Italy, France, Austria, Portugal and Belgium). Emanuel was voted the best player in the 1990s by the FIVB. He won the Circuito Banco do Brasil season's points title six times with three different partners - Ze Marco (1994 and 1995), Tande (2001) and Ricardo (2002, 2003, 2006). He has been honored as the Circuito Banco do Brasil best player (2003 and 2004) and top attacker (1999, 2003 and 2006). He was won the Brazilian "King of the Beach" competition twice (2004 and 2005). Emanuel has a son (Mateus, August 12, 1997). Emanuel is the son of Manoel and Maria Rego. He has a sister (Aniele, 37). 2012: Emanuel and Alison won twice in their 10 events together during a stretch which saw them play in six straight title matches. The last of those title match appearances came in the London Olympics as they claimed the Silver medal. The duo finished second in season points on the tour. 2011: Emanuel and Alison won five times, including the World Championships in Rome. Helped by three other Final Four finishes, the duo won the season points championship, marking the 10th time in Emanuel's career he has been part of the FIVB Tour Championship team. The pair won the Pan American Games in Guadalajara to close the season. 2010: Emanuel began a partnership with Alison. The duo advanced to the Final Four in seven of the 11 tournaments, with a best of second place three times. It marked the first time since Emanuel's first season in 1994 that he did not win a single tournament. 2009: Playing in Brazil in the season opener, Emanuel and Ricardo won, but it would be the last of their record-setting 33 FIVB Tour victories together. They placed fifth in the World Championships in Stavanger. The duo finished the year together, adding two second-place finishes before concluding their season and partnership with a 17th. They played in one AVP Tour event, finishing third. 2008: Emanuel and Ricardo won twice in 11 tournaments together, and Emanuel played one time with Alison Cerutti, placing third. Emanuel and Ricardo won the Bronze Medal in the Beijing Olympics. 2007: Winning seven times in 15 events was enough to give Emanuel and Ricardo their fifth consecutive FIVB points championship. The duo placed fourth in the World Championships in Gstaad and won the Pan American Games held in Rio de Janeiro. 2006: Emanuel and Ricardo were the top-ranked team for the fourth straight year after advancing to the semifinals in all 14 of their events. They won five times and added five silver medals. 2005: Emanuel and Ricardo claimed their third straight points championship, but only by 12 points (out of 5,108 earned). The duo won six times in 15 events, but Emanuel placed 17th for just the second time in his career at the World Championships in Berlin. They also won a Satellite event. 2004: For the second straight season, Emanuel and Ricardo were the top-ranked FIVB team. They won seven titles in 13 tries, including winning the Gold Medal in the Athens Olympics. Emanuel played one time with Pedro Brazao, finishing 17th. 2003: Emanuel continued his partnership with Ricardo. The duo won five of the 10 events, capping off the season with a win in the World Championships in Rio de Janeiro. The pair were the top-ranked team on the FIVB. 2002: After winning one title in seven events with Ramos, Emanuel ended the year with a pair of thirds with Ricardo Santos. 2001: Emanuel teamed with Ramos and they won five titles in 11 events together. In the World Championships in Klagenfurt, the duo placed fifth. They ended the season as the top-ranked team on tour. Emanuel competed with Rogerio Para Ferreira in the Goodwill Games, finishing sixth. 2000: Emanuel and Loiola won four times in 12 FIVB events, with their final appearance coming in the Sydney Olympics where they placed ninth. Emanuel finished the season with a second-place finish with Tande Ramos. Emanuel and Loiola again played on the AVP Tour, winning three times in six tournaments. 1999: Emanuel and Loiola were the top-ranked team on the FIVB after winning seven times, including six consecutive events. Included in that span was a victory in the World Championships in Marseille. The duo again played on the AVP Tour, placing second twice and third three times. 1998: Emanuel formed a new partnership with Jose Loiola, winning four times out of 10 events on the FIVB Tour. The duo finished ranked second on the FIVB. Emanuel also competed on the AVP Tour, winning once (out of seven tournaments) with Gomes, winning his only event with Kent Steffes, and winning twice (out of seven events) with Loiola. 1997: Emanuel and Ze Marco won five of the 11 events and for the second straight season were the top-ranked team on the FIVB. The duo placed fifth in the World Championships in Los Angeles. 1996: Continued playing with Ze Marco, winning five times. The duo placed ninth in the Atlanta Olympics. Emanuel and Ze Marco had 10 podium finishes in 14 events together, and won the season points championship. Emanuel also won a bronze medal playing in one event with Andre Gomes. 1995: Started a partnership with Ze Marco de Melo, and the duo placed second in their first FIVB event together in Brazil. In 15 events in their inaugural season, the new partnership yielded five wins, four seconds and three thirds. The pair finished second in the FIVB rankings. 1994: Began his career playing alongside Aloizio Claudino, and the duo had a best of fourth in their six FIVB events.